With the UK’s road network crumbling under the strain of poor funding more and more drivers are encountering potholes and bad surfaces, to such an extent that one motoring firm is calling on learner drivers to be able to spot holes in the road. Recent reports from driving instructors tells of both lessons and tests being disrupted after cars break down due to the state of the road, and many instructors are avoiding the worst hit roads to avoid damage to tyres, wheels and suspension. But the AA claims that with instructors avoiding the problem, the UK’s new drivers are ill-equipped to deal with potholes when they actually encounter them. AA president Edmund King said: "It's a sad indictment of our poor road conditions that instructors are having to adapt their lessons to avoid potholed roads. "More troubling is the fact that lessons and tests are being abandoned because of pothole-related breakdowns. "The situation is so serious that the hazard perception test and Highway Code need to change to reflect the state of the roads that learner drivers have to learn on. "There is no advice for drivers about potholes anywhere in the Highway Code yet it is one of the most common hazards they encounter." Pass rates on driving tests have already dropped to a nine-year low following a major shake-up of the practical driving test rules, but the AA also wants the theory driving test changed, with new rules added to the hazard perception which account for potholes in roads. 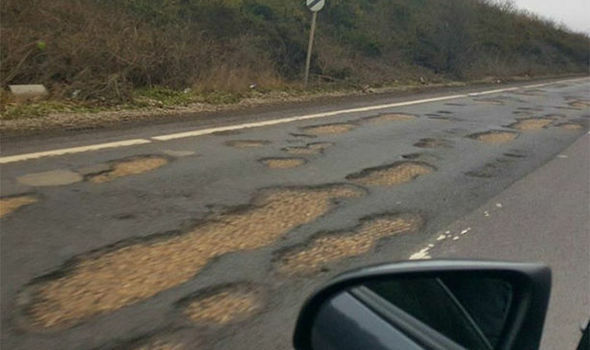 Despite the increase in poorly maintained roads, a recent Government statement suggested that more funds were being made available to fix the problems on the highway. "We have listened to the concerns of road users and are already providing councils in England with over £6billion to help improve the condition of our local highways,” the statement said. "This funding includes a record £296 million through the Pothole Action Fund - enough to fix around six million potholes."